As sports leagues and teams increasingly become lucrative businesses, teams are finding significant value by paying attention to previously ignored variables. Companies outside the sporting world should take note. The English Premier League has had a massive 14% compound annual growth rate since its founding in 1992 and recently auctioned its TV rights for a stunning 7.8 billion USD, making the league and the teams that participate quite large business concerns. Their most important employees – players – can earn up to half a million dollars per week and decide their fortunes with a single moment of genius. Quite surprisingly, many clubs ignored player behavior outside of training and matchday activities as recently as the 1990s. Arsenal midfielder Ray Parlour (‘93-’04) recounts those heady days with tales of unexpectedly starting a match against Liverpool after downing two pints of beer. Arsenal manager Arsene Wenger famously put an end to the excess when he arrived in 1996 and nearly started a player revolt at the club. As the story goes, Wenger walked down the bus aisle on the way to a match and picked out the Mars bars from the players’ pre-match meals. 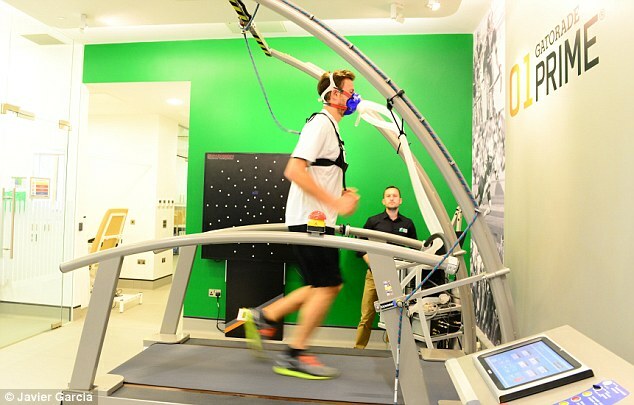 What began as an experiment in sports science at Arsenal has since spread throughout the sporting world. Teams measure and manage every variable of players’ physical and psychological state in order to ensure their best performances on the field. When it comes to sleep, clubs retain specialists to fine-tune players’ sleeping schedules and book hotel rooms with customized mattresses for every player – even for home games. Teams manage player diets, employ medical teams of physiotherapists, massage therapists, doctors and athletic trainers who meticulously assess and adjust players’ movements for injury risk. Diet is subject to similar scrutiny. Clubs like Arsenal routinely retain sports psychologists to assess players’ mental strengths and help them discover their best form. Arsenal midfielder Aaron Ramsey credits sports psychologistsin part for helping him recover from a horror tackle that left him with an open fracture of his lower leg. Companies can realize real value in team performance by learning from the world of professional sports. Just as they affect player performance, variables like sleep and diet have very real effects on employee performance. Workplace conflicts are often preceded by late nights in the office, sleep deprivation or other sources of stress. There are many forces at play below the surface, any of which could cause a bad business outcome. Consequentially, businesses can expect better outcomes by ensuring their employees consistently get enough sleep, eat a healthy diet, maintain decent physical conditions and avoid unnecessary stress. However, businesses have been reluctant to manage employees outside of the workplace. Much of that has to do with protecting employees’ free time and preserving their privacy. Modern management has its roots in Frederick Taylor’s Scientific Management theory, in which measurement and prescription played a rather large role. Similar to sports’ obsession with statistics, Taylor measured worker output in steel mills and found that he could increase productivity by integrating rest breaks into the workday. Despite the general reluctance, a number of forward-thinking companies have been incentivizing their employees to modify behaviors outside the traditional workplace boundaries by re-framing them as perks. Google is famous for its perks – from fully stocked espresso bars to nap rooms. A nap at work? Rather than villainizing it as laziness, companies should heed scientific studies finding manifold benefits: a recent NASA study on drowsy military pilots found that a 40-minute nap increased alertness by 100% and overall performance by 34%. Can’t argue with those numbers. Companies are starting to offer subsidies towards health club memberships. While they’re perceived as perks by employees, companies reap the benefit in cheaper pooled health insurance premiums in addition to the everyday business benefits. Companies like LinkedIn are also catering meals in the office, reducing the need for employees to venture out, wasting time, fatiguing their finite decision-making reserves, and potentially making unhealthy choices in the process. Ironically, liquor company Diageo bought its employees Fitbits to track their exercise, calorie consumption and sleep. Regardless of whether the technology works, simply having one on your wrist is a powerful reminder to maintain a healthy lifestyle. It’s easy to imagine a dystopian future where your boss sends you a message deriding you for staying out too late the previous night. Obviously there are limits that shouldn’t be crossed. Folks will object that sometimes tight deadlines require extra effort and cutting corners. Of course those situations will require the odd late night and elevated stress levels. But companies should be mindful that a candle lit from both ends burns twice as bright but half as long; building and delivering sustainable value means ensuring a sustainably healthy workforce that arrives at work well-rested, well-fed and maintains a healthy level of physical activity and stress. As the sports world is increasingly demonstrating, these “perks” can be the difference between winning and losing – no matter what business you’re in. 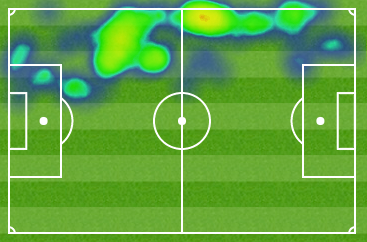 Nacho Monreal’s heatmap as a left-back. His average position is quite close to the midfield line.